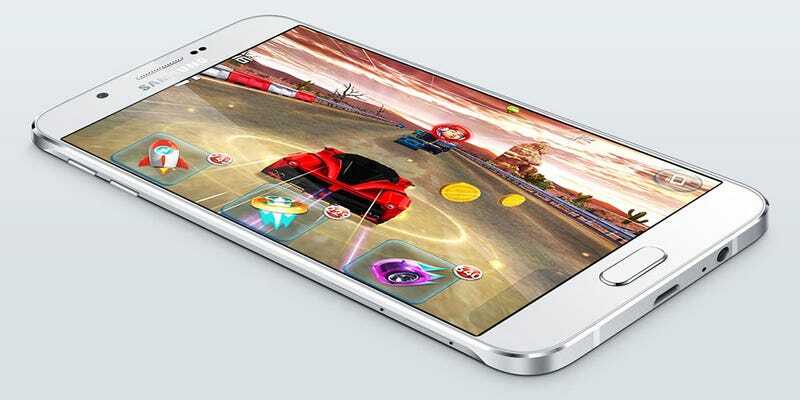 Samsung has announced the latest in its A series of phones: the Galaxy A8. It isn’t the most powerful phone, but its all-metal body makes it Samsung’s thinnest ever—but sadly, you might not be able to buy one. The new phone measures just 5.9 millimeters in thickness and weighs 5.3 oz. In terms of specs, there’s a 5.7-inch 1080p OLED display (with a particularly skinny bezel), an 8-core Snapdragon 615 chip, 16-megapixel rear camera, 5-megapixel front camera, 2GB of RAM, a 3,050mAh battery and a fingerprint sensor. All told, it’s a fairly mid-range Android device wrapped up in a slim, sleek exterior. The device has been launched in China, where it’s expected to sell for 3,499 yuan, or about $560. There’s no word on forthcoming U.S. availability yet. It will be available in black, white and gold.